Wick, flint and lighter fluid - what & where to buy? The links refer to amazon.com but if you are from a different country you may use your local amazon store. The recommended lighter accessories can be also bought at eBay and your local tobacco store. 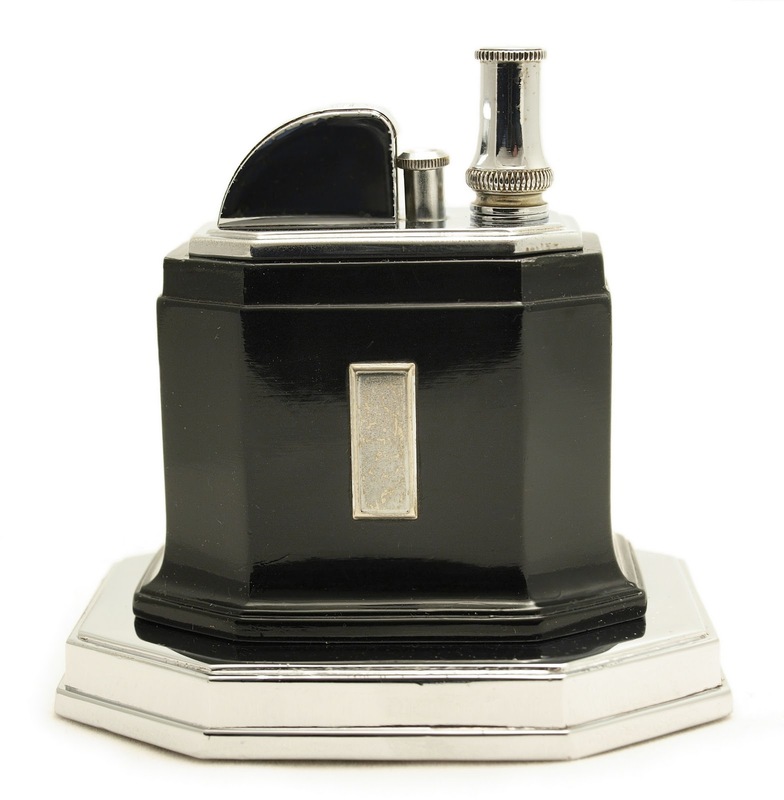 This modern Cartier Paris 303 Table Lighter was made in the late 1990s by Cartier S.A. in Switzerland. 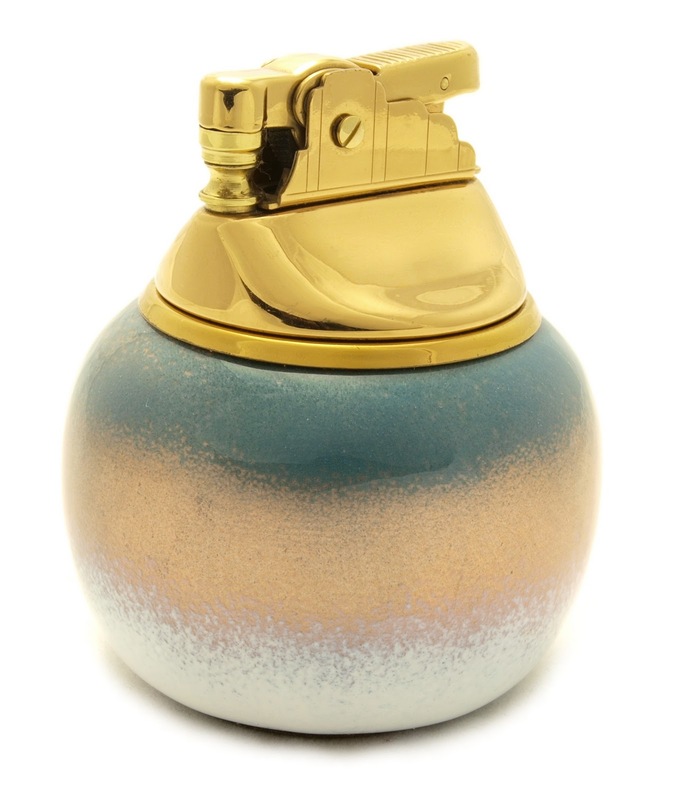 It is an oval shaped semiautomatic table lighter made in brush silver finish with a gold plated ring on the top. Cartier is renowned French luxury jeweler and watch manufacturer founded in Paris in 1847 by Louis-François Cartier when he took over the workshop of his master. The product range of Cartier ranges today from timepieces, leather goods to accessories such as cigarette lighters. The Ronson Bolero Set was manufactured between 1954 and 1955 in Newark, United States of America. The set (model no. 43625) consists of a wick table lighter and a matching ash-tray which was also available seperate (model no. 43637). The bottoms of both the base of the lighter and ashtray are padded with green felt. Other unique ceramic sets made by Ronson beside the Bolero Set were called Tropicana and Fiesta which are also rare. In England a similar set to the Bolero Set was manufactured, although it was called Ronson Wade Harmony Set. 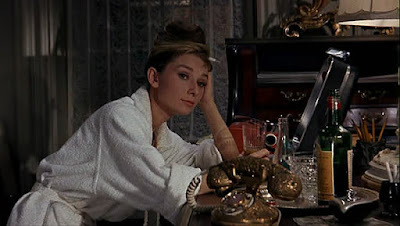 Worth to know is that the Bolero lighter was featured in the great American movie "Breakfast at Tiffany's". 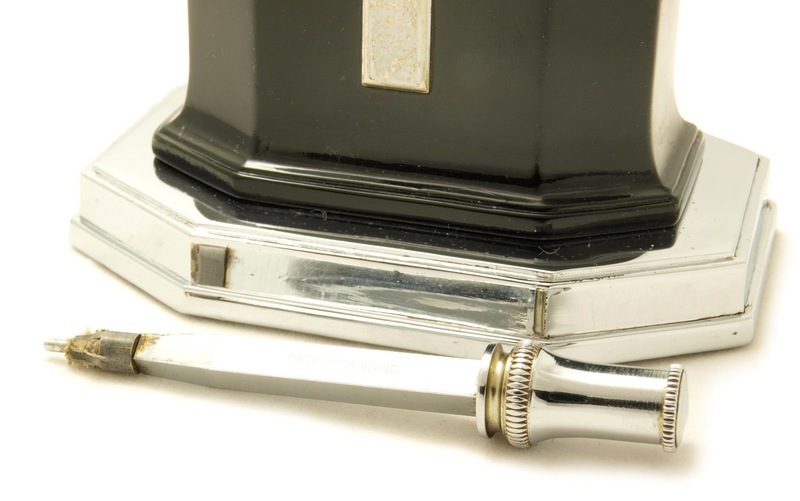 The United Bovano Cheshire Automobile table lighter was manufactured in 1957 United States by United Findings Co. Inc. and Bovano of Cheshire, Connecticut. The wick lighter insert was provided by United. The colorful handy base was however crafted by Bovano of Cheshire which started its business in 1952 and which is still active today. The company was founded by Bonsignor, Van Leight and Noden. It is designing and hand crafting high quality wall and table sculptures using powdered glass fused to small copper plates and glass. The lighter base is hand enameled (pulverized glass) in three different colors using a delicate sprinkling method layered over solid copper and then kiln fired which makes the base look vitreous and noble. 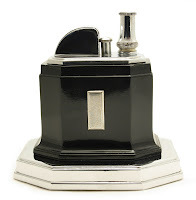 The Ronson Touch-Tip 'Octette' table lighter was made between 1935 and 1951 by Ronson / Art Metal Works Inc. in Newark, New Jersey in the United States. This lighter began a very successful era for Ronson T-T series of lighters which pushed out the strike lighters from the market. During the years the 'Octette' model changed slightly: at the beginning it was manufactured with a rectangular cover over the flint wheel and a round-shaft wand. Since the 1942 the cover over the flint wheel was half circled and the wand had a square shaft and a tapered cone knob (see pictures). The 'Octette' has a genuine pure Art Deco design. It is very heavy although its relatively small dimensions. Fitment and base are made of polished chrome and the metal body was finished in different enamels: black (most popular), tortoise or white. Less popular finishes include: green, maroon enamel and many others. The polished center monogram shield was on one side. It was available in many various configurations including pipe racks, cigarette boxes pipe holders, figures (golfer), thermometer, clock etc. MFD BY RONSON NEWARK, N.J., U.S.A.
OTHER U.S. & FOR. PATS. PDG. See also the touch-tip 'Octette' patent.